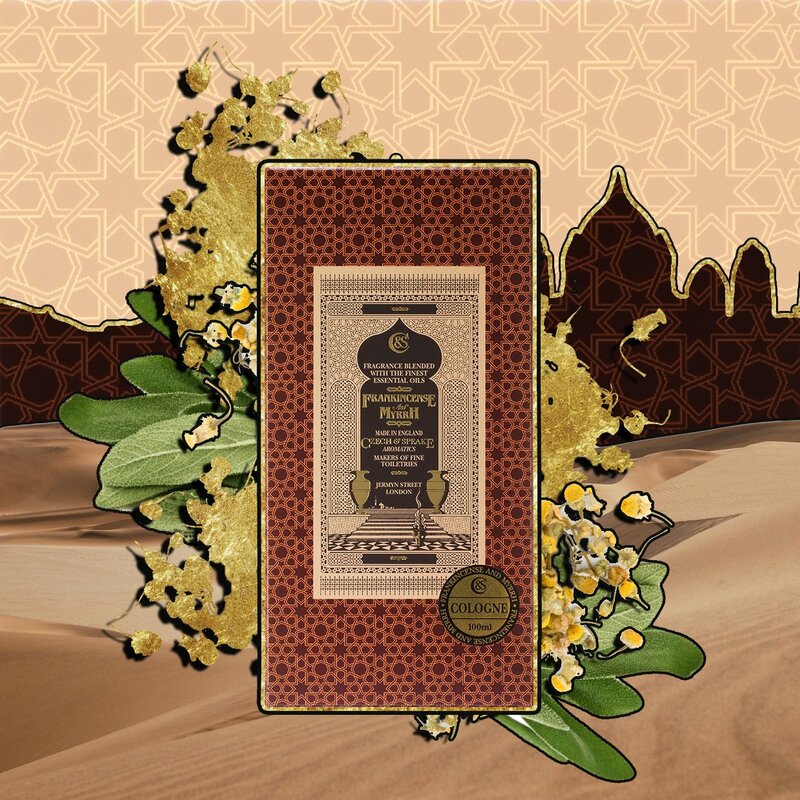 The Frankincense & Myrrh range by Czech and Speake is truly exotic; a deep sensual scent that transports you to the opulence of the Orient. The rich blend of warm frankincense, the sharpness of myrrh and the woody rich base notes of cedar wood and sandalwood are topped by the fresh scents of orange, lemon and basil which give the Frankincense and Myrrh fragrance an exotic and distinctive twist. At Christmas time, our Frankincense and Myrrh range is meaningful to many households, due to its associations with the age-old biblical stories that define our festive season. We all know the Bible story about the Three Wise Men bringing Baby Jesus gold, frankincense, and myrrh. Matthew II tells us that the wise men journeyed from the East in search of the Christ child. They asked of King Herod where they can find Him, saying, “Where is he who has been born king of the Jews? For we saw his star when it rose and have come to worship him” (Matthew 2:2). Upon finding the baby Jesus, “they bowed down and worshipped him. Then they opened their treasures and presented him with gifts of gold and of incense and of myrrh” (Matthew 2:11). This Christmas narrative has been passed down to us through the generations, with particular significance to our childhood, in which we were taught the tale through family and education. The majority of us will have vivid memories of participating in school Nativities, centring around the gift-giving to the newborn Christ. These deep-rooted connections mean that our Frankincense & Myrrh range has remained relevant and meaningful to households, enhancing the tradition and spirit of the season. We have have been making some of the finest smelling toiletries since 1978 and the popularity of our Frankincense and Myrrh naturally rises during the winter months. This fragrance is often described as a cold-weather fragrance that will warm you up. Would you like to shop our favourite Frankincense & Myrrh Christmas products range? Here we have listed our most popular items under the Frankincense & Myrrh. Make your house smell gorgeous this Christmas. The kit comes with a porcelain incense stick holder designed to catch the ashes which will inevitably fall. Each of the sticks will burn generously for approximately 1 hour (depending upon airflow). The incense will create an exotic and warming atmosphere in your living space with its harmonic influence. Notes of lemon, orange basil and clary sage will fill the air, and the exotic myrrh, chamomile & pimento leaf will enhance the festive spirit as the distinctive scents will complement the traditional associations with Christmas. When a simpler, more instant approach is desired, opt for the room spray in the same range. 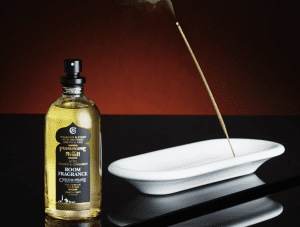 The Frankincense & Myrrh fragrance in a room spray form has the added benefit of enabling you to infuse the smell into your soft furnishings so that when you entertain during the festive period, you can transform your home into a seasonal, and sensual experience for your guests. Winter is the perfect time to indulge in a calming and luxury effect of candles. 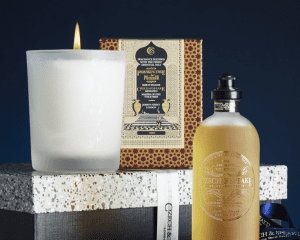 Our Frankincense & Myrrh candle is presented in a stylish etched glass holder, the deep and exotic fragrance is blended throughout and burns for up to 35 hours. With notes of orange basil, myrrh, pimento leaf, cedarwood & sandalwood it has a spicy, heady scent. When stepping in from the bitter cold, this candle will promptly warm your senses with its sumptuous, inviting aroma. Curl up on an armchair while the notes of orange basil and sandalwood immerse your senses, and rebalance your mood. Our Frankincense & Myrrh cologne mustn’t be missed from our list of favorites in the range, so we saved our best-seller till the end. This is a heavy, slow-evaporating scent perfect for winter. Presented in a beautiful frosted glass bottle, this cologne is rich in concentrate and desirably long lasting. Aromatic, sensual, deep and delicately sweet with woody undertones. These revered aromatic resins resonate ancient, cultural history, in parts of the world such as Jerusalem, which define our celebratory season, therefore making it the perfect Christmas fragrance. The cologne contains notes of orange basil, myrrh, pimento leaf, cedarwood & sandalwood. Wanting to spoil your loved ones this Christmas with the best luxurious fragrances? Czech and Speake do not disappoint as our extensive range of scents are accessible in a variety of forms – candles, colognes, aftershaves, bath oils, incense sticks and more – made to last and create a charming mood. The Frankincense & Myrrh range is ideal for Christmas – you can purchase your gifts from the range here.